SwissBullion.ch sell bullion coins manufactured by the Mexican Mint located in Mexico City. 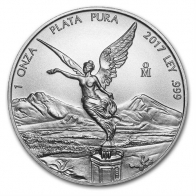 Currently the only silver coin manufactured by the Mexican Mint is the silver Libertad coin - this coin is available in both current year and backyear versions. Unlike most silver coins, the silver Libertad coin is available in a range of sizes, including 1/2 Ounce, 1 Ounce, 2 Ounce, 5 Ounce, 10 Ounce and 1 Kilogram sizes. The Mexican Mint also produce the Libertad in gold, and the Peso Gold coin series, which is only available in gold. All Mexican silver bullion coins are available for VAT-exempt Swiss storage or delivery worldwide.